Not bad for a signature move for one of the 50 Most Eligible Bachelors of 2004, according to People Magazine. Not that he likely needs a major signature move, but handing out candy sounds like a good one, to me! Canadian, Ryan Gosling was nicknamed “Trouble” back in high school when he attended in Cornwall and Burlington, Ontario. He was born in London (yes, Ontario) and was home-schooled by his mom until he went to high school. He did excel in Drama and Fine Arts, (as we would expect) but only he knows why he was nicknamed “Trouble”. Maybe he will tell Emma Stone, so she will reveal that during her next interview! Twizzlers are perfect for keeping in an inside jacket pocket. Even in an outside jacket pocket. Maybe any pocket, really. I think we should recommend to Twizzlers that they make some pocket protectors with their name emblazoned on them! Long and skinny like pencils, keeping the classic long, narrow Twizzlers candy handy in a jacket pocket is a novel idea, for sure. Creative guy, that Ryan Gosling. Twizzlers candies come in all sorts of shapes and flavours. Classic, long, narrow strawberry shaped Twizzler Twists are really the best for jacket pockets, but the classic black and cherry Twizzler Twists can be hard to resist, too! For those who are less traditional, chocolate, strawberry lemonade filled, plus the sweet and sour filled will fit perfectly in your jacket pocket and your mouth. The Pull ‘n Peel flavours, cheery, watermelon and fruit punch are even more fun for those of us who love to play with our candy some. There is an immense sense of satisfaction that comes from ripping… I mean… pulling… those pieces apart! Best stress therapy, ever! The Twizzler Bites and Nibs make it much easier to eat them in secret. (Shhhhh! I won’t tell if you don’t!) Just pop one into your mouth and it disappears. Gloriously. Bursting with flavour making happiness in your mouth. There’s a rumour that maybe Buzz Aldrin ate some Twizzlers in space on his way to the moon. I can’t blame him really. If I were going to be that far from home I would take some candy along with me, too! Twizzlers Candy set the world record in 1998 for the longest piece of licorice ever made. It’s in the Guinness Book of World Records and everything. It was 1,200 feet (over 365 meters!) long. Can you imagine how much that thing weighed? It was made in the Pennsylvania plant specifically with the goal to break the world’s record. That sounds like serious work to me, but perhaps not. “Try as you may, but you CAN’T be serious with Twizzlers,” is the Twizzlers candy motto. Try it. They dare you. I would never try! 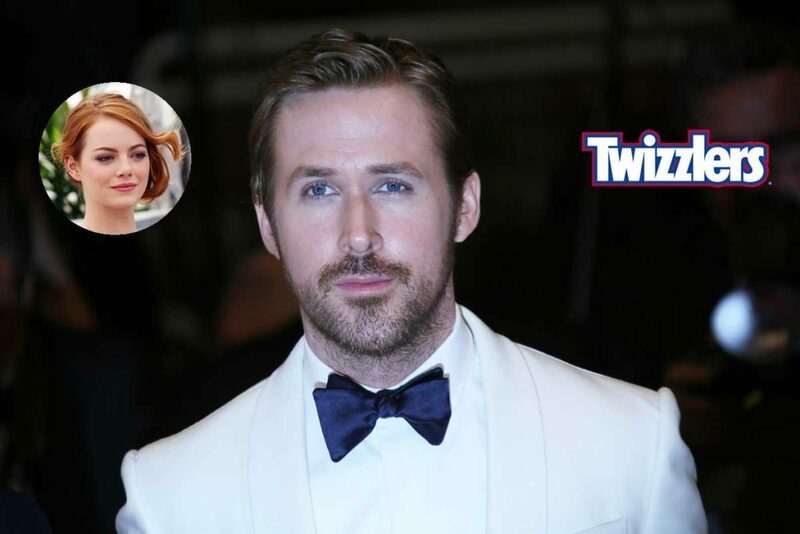 So, when you next visit with Ryan Gosling and want to impress him with some candy, or you’re headed to the moon, make sure to bring some Y&S classic Strawberry Twizzlers. And say “hi” to Ryan for me, okay?